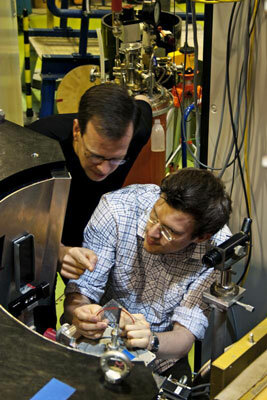 (Nanowerk News) Researchers from the Helmholtz-Zentrum Berlin für Materialien und Energie (HZB) have, in cooperation with colleagues from Dresden (Germany), St. Andrews (UK), La Plata (Argentina) and Oxford (UK), for the first time observed magnetic monopoles and how they emerge in a real material. They publish this result in the journal Science within the Science Express web site on 3. September. Jonathan Morris, Alan Tennant and colleagues (HZB) undertook a neutron scattering experiment at the Berlin research reactor. The material under investigation was a single crystal of Dysprosium Titanate. This material crystallises in a quite remarkable geometry, the so called pyrochlore-lattice. With the help of neutron scattering Morris and Tennant show that the magnetic moments inside the material had reorganised into so-called "Spin-Spaghetti". This name comes from the ordering of the dipoles themselves, such that a network of contorted tubes (Strings) develops, through which magnetic flux is transported. These can be made visible by their interaction with the neutrons which themselves carry a magnetic moment. Thus the neutrons scatter as a reciprocal representation of the Strings. In this work the researchers, for the first time, attest that monopoles exist as emergent states of matter, i.e. they emerge from special arrangements of dipoles and are completely different from the constituents of the material. However, alongside this fundamental knowledge, Jonathan Morris explains the further meaning of the results: "We are writing about new, fundamental properties of matter. These properties are generally valid for materials with the same topology, that is for magnetic moments on the pyrochlore lattice. For the development of new technologies this can have big implications. Above all it signifies the first time fractionalisation in three dimensions is observed."